Identifying winter water is the biggest key to catching a lot of trout when the snow is on the ground. In the winter the fish tend to gather up and winter over in certain sections of river that offer them a few advantages to getting past the long cold months. You can save yourself some prospecting time by keying in on the places where fish want to be. Food source is certainly a driving factor for these fish when it’s cold. The winter months really only provide the fish with one insect to eat. That is the Midge. Although this insect can be found all year, it becomes prevalent in the winter and the main food source for trout, outside of eating other fish. Midge water normally consists of slow moving water. It may be a smooth surface, a riffled surface or even a foam filled back-eddy. These are places where fish can easily sip Midges from the surface. Often times, finding these areas is as simple as looking at the snowy banks and looking for the bug peppering the bankside snow. If you see this, watch the nearby water closely for rising fish! This normally happens between the hours of 11:00 a.m. and 4:00 p.m.
Water depth is also a key component to finding winter holding water. Try to find areas that are from thigh to waist deep water. Avoid the thinnest water at the head of the pools, unless the Midge activity is off the charts. Than you may find fish moving into skinny water. Mostly though, watch the middle of the pools. Avoid going super deep, unless there are no bugs and its super cold outside. Runs that have boulders and other structures are often great places to watch for rising fish. 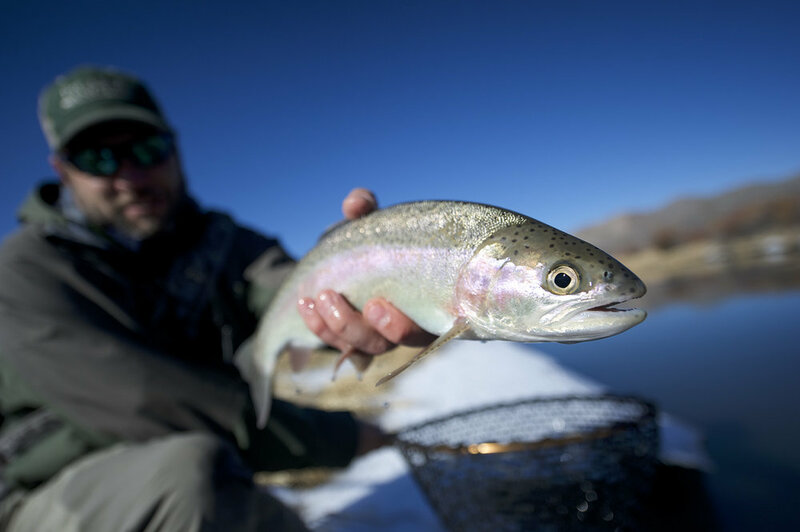 Slow water is among the most important attributes to finding winter fish. Fishing can be broken down into the simplest math. Fish will not spend more calories to take in food than they are expending. This means a fish will not sit in fast water when there is no available food source, or not enough food to make up the calorie exchange. Finding water where a fish can fin easily in the current or lack thereof is huge. The fish need water slow enough to see the tiniest Midge, but fast enough to keep their gills pumping oxygen. A good rule, if the water is difficult to wade or cross, it is too fast!